Bios-Urn has finally reached Australian shores, landing in Queensland late September 2016 and then introduced to Western Australia early November 2016 by Bryce Roberts called ‘Tree of Memories; Life after Life’. 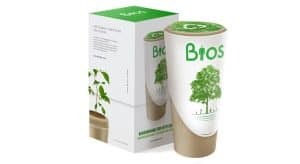 Bios-Urn is constructed from 100% biodegradable material and has been carefully constructed and designed specifically for Australia’s varying climatic conditions. The simple yet effective design has been created in two sections. The top capsule contains a bag of organic potting mix which maximizes and assists your seedlings growth. The bottom capsule carries the ashes of your loved one or pet. If you have a loved one whose wishes are to be cremated but they do not have prior funeral cover, cemeteries can be extremely costly due to overheads such as taxes and maintenance. The nature reserve plot chosen for your loved one is also only secured for a time frame not a lifetime. They are not economical and ecologically, can be toxic in nature as they can leak embalming fluids into the earth.